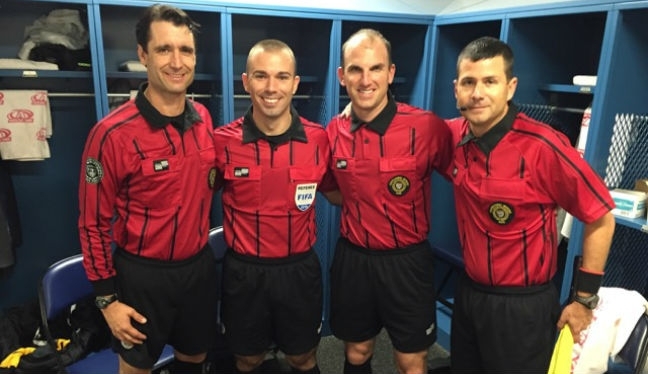 Ted Unkel was the man in the middle for the 2015 Lamar Hunt U.S. Open Cup Final and the referee has revealed his pride at officiating the game. Sporting Kansas City ran out winners, beating Philadelphia Union 7-6 on penalties after a 1-1 draw at PPL Park, and we’ve caught up with PRO referee Unkel to reflect on the occasion. What were your first feelings and thoughts when you heard about your assignment to the Lamar Hunt U.S. Open Cup? Immense pride. The Lamar Hunt U.S. Open Cup is a storied tournament, and one that begins at the grassroots level. Most of us referees have been a part of this tournament at some stage well before we received our professional badges. To be able to referee the final is undoubtedly an honor. How did you prepare for the game – did you do anything differently, individually, or with the crew, to what you would do before a regular season game? We approached the Open Cup Final very similarly to how we would a MLS match – part of that is the familiarity we have as a crew of Sporting KC and Philadelphia Union, in working their matches throughout the season. Another part of it is my firm belief that to be successful in anything you should be even keel – never too high, never too low. Additionally, Ian [Anderson, AR1], Jimmy [James Conlee, AR2], Chris [Penso, 4th] and Corey [Parker, reserve AR] are all accomplished and talented referees. Knowing that was my team gave me even more confidence going in. In the build-up to the game, did you feel any extra nerves or excitement with this being the Open Cup Final? I have some nervous excitement going into every match that I do – I never take any game for granted. It’s a privilege to do what we get to do, and no future assignment is ever guaranteed. That being said, I was well aware of what this Cup Final meant to both clubs – Philly was back for the second straight year, and had heartbreak in dropping last year’s Final. They have a passionate fan base that is eager for a championship. On the other side of the ball, Sporting KC has had quite a bit of success in recent times yet there was no less hunger for another trophy. I followed both clubs approach in the weekend league games prior and the days leading up, and caught a hype video posted online that would give anyone associated with this game, or soccer in general, a jolt of anticipation. How do you feel the game went from an officiating point of view? Does the prospect of extra-time and penalties present any different challenges as a referee? As an official, you never want to be the story – and in a final, even more so. The teams deserve every opportunity within the Laws of the Game to determine the outcome. I believe we accomplished that. There will always be talking and learning points, though we managed and helped orchestrate the match very successfully. I’m proud of the job we did in what was a tough, emotional match. The weather and conditions of the pitch led to some tackles and challenges that we wouldn’t have had to deal with otherwise. The extra 30 minutes is a nod to adrenaline and PRO Sports Scientist Matt Hawkey. As for the kicks from the mark, the energy in PPL Park was electric. We still have a job to do at that time, but it’s hard not to be a little bit of a fan as well – the two teams that just battled for 120 minutes are about to settle the difference. And there were some great, well-placed kicks taken. You’ve gone from 4th official to an MLS center referee, to a U.S. Open Cup Final referee in a relatively short space of time, what are your next targets? After the Cup Final my next target was my 7th October match between Montreal Impact and New York Red Bulls, and now it’s being there for my wife when our first child is born – due date of October 24th. That will be worthy of quite the celebration.